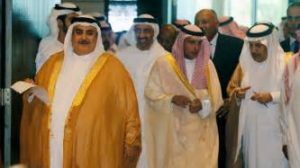 The four countries opposed to Qatar in the Gulf crisis have slammed the UN commission on Human Rights ((OHCHR) for its report accusing the quartet for imposing an unlawful blockade on Qatar in the diplomatic crisis that has gripped the region. Saudi Arabia, United Arab Emirates (UAE), Bahrain and Egypt have issued a joint statement calling the findings of the commission inaccurate, misleading and based on unfounded allegations, al Jazeera reports citing the Saudi state news agency SPA. Qatar, following the imposition of a sea, air and land embargo by the four countries since June last year over claims that the tiny gulf Emirate sponsors terrorism, referred to the commission for arbitration. The commission issued its report following a sojourn in Qatar, in November, of a team of experts to document the effects of the blockade on human rights among Qatar’s population. The commission noted that the embargo was discriminatory and similar to “economic warfare’. The Saudi-led group rejected the UN conclusion, noting that their move was dictated by Qatar’s incitement of violence and promotion of hate speech in the Arab world. “The basis of this crisis goes back to the background of Qatar’s support for individuals and entities internationally involved in financing terrorism and supporting its activities, and promoting their extremist ideology, which incites violence and promotes hate speech in the Arab region through Qatari media platforms or funded through Qatari figures,” they said. Qatar has rejected the blockading countries’ assault on the UN commission. OHCHR representatives conducted interviews with 20 government and non-governmental organizations, and 40 victims during the course of their evaluation, al Jazeera reports. Written by: KanelkaTagba on January 31, 2018. Posted by KanelkaTagba on Jan 31 2018. Filed under Gulf News, Headlines, World News. You can follow any responses to this entry through the RSS 2.0. Both comments and pings are currently closed.